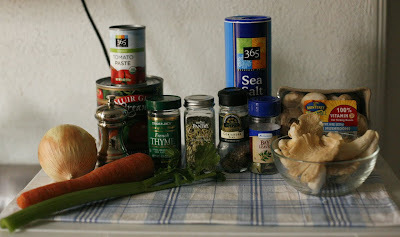 I saved this recipe for last because, to tell you the truth, I was really intimated to make them. It sounded really complicated to make. 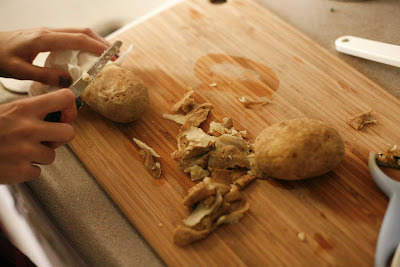 The idea of having to peel the potatoes while they are still smoking hot and having to rush to shape and boil them really scared me. But as I started to make them, it actually wasn't that hard at all. The dough came together nicely and if you have everything already set out ( the floured plate, a boiling pot of water ) everything should go smoothly. I loved watching them float to the surface and how cute and puffed up they looked once cooked. 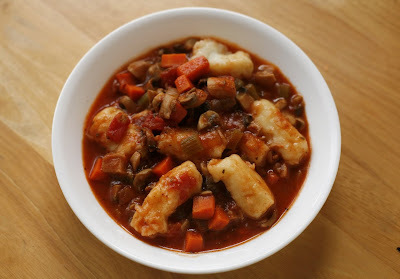 Since I've never made gnocchi before I came across this recipe on Food Network and thought it sounded wonderful for a Friday dinner. They suggest using 2 pounds of wild mushrooms but because they are so high in price, I reduced the amount of wild mushrooms to maybe half a pound. There's no way I am paying over $20 for mushrooms but if you are working with a large budget, please do add them all. It sounds like it would be wonderful with mushrooms of all types. I love everything about this meal. I am still searching for my main Christmas meal and now this seems like something I would want to bring over to my Aunt's house. It really did impress me in taste and appearance. 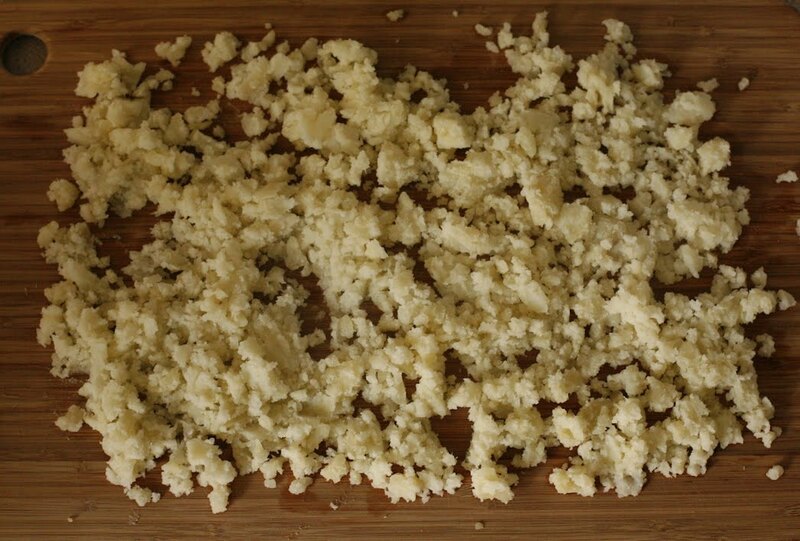 Before you start making the ragu, it is suggested that you cook the potatoes. That way the potatoes will be done by the time you are done making the sauce. 1. 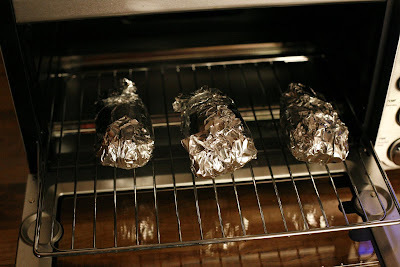 Preheat oven to 425 F. Pierce the potatoes several times with a fork than wrap in foil and bake for 60 minutes or until soft. 2. While that cooks, begin making your sauce. Heat the olive oil in a large pot over medium high heat. 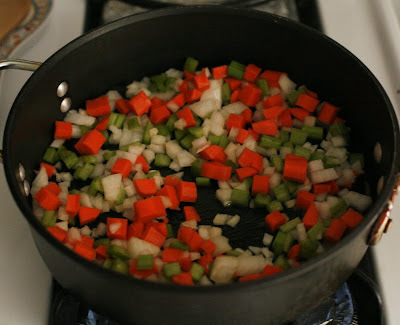 Add the onion, carrot and celery and cook until soft, about 5 minutes. 3. Add half the mushrooms and cook until golden, 3 to 5 minutes. 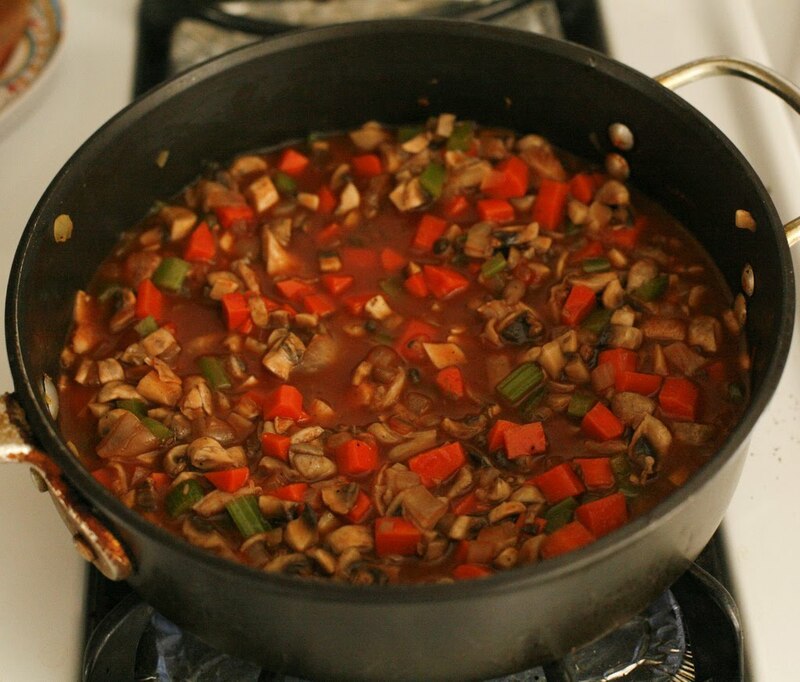 Add the remaining mushrooms and cook 3 to 5 more minutes. Season with salt and pepper. 4. Add the tomato paste and cook, stirring with a wooden spoon, about 2 minutes. 5. 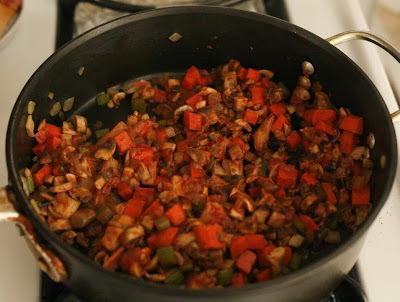 Add the wine or veggie stock, cook, scraping up the browned bits, about 2 more minutes. 6. Add the tomatoes, 2 cups of water, bay leaves, coriander, fennel, red pepper flakes, thyme, 1/2 tsp of salt and pepper to taste. 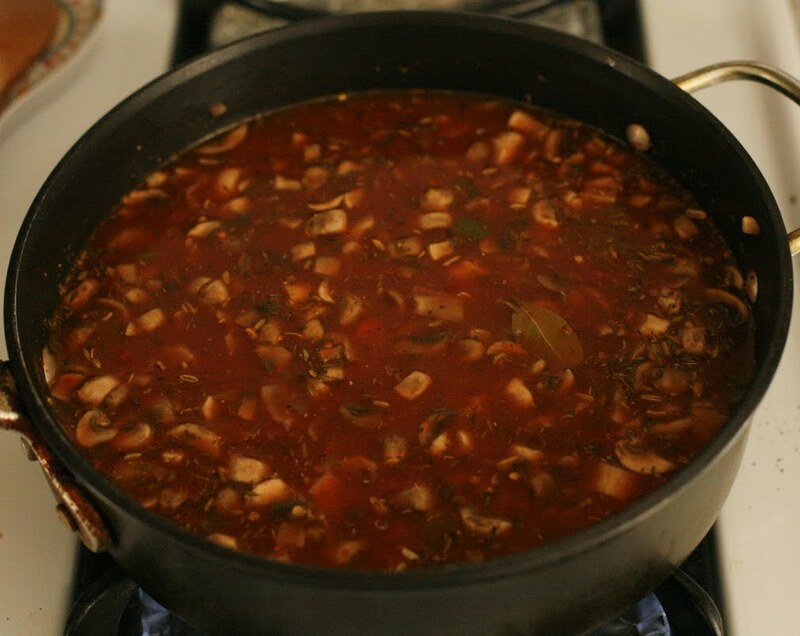 Simmer over medium heat, for 30 minutes. Season with more salt and pepper if needed. 7. By now the potatoes should be done baking, if not wait until they are. Should be just a couple more minutes. In the meantime, bring a large pot of salted water to a boil. Once they are done, remove the foil and start peeling away the skin. Do not allow them to cool, you must work with them hot. I suggest using a towel to help protect your hands from burning. Using a knife to peel away the skin works best. 8. Place the potatoes in a ricer or food mill and mash. If you do not have one, using a fork or shredder will work just as well. Spread them out on a cutting board and allow to cool for about 5 minutes. 9. Gather the potatoes and sprinkle half a cup of flour over them. Mix by hand until the dough is smooth. Kneading is not necessary here. Add more flour if it starts to feel too sticky. 10. 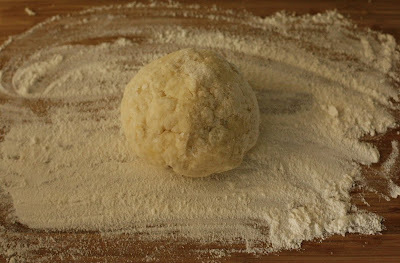 Now divide the dough into about 5 pieces. Grab each piece and start to make them into a log shape. Rolling the dough did not work best for me because they started to break apart. So a slow squeeze and pull of the dough did the trick. Keep shaping until they are about 1/2 inch thick. 11. Cut the logs into 1 inch pieces and dust with flour. To shape the gnocchi, roll each pillow on the tines of a fork or a gnocchi board, if you have one. Place all the shaped gnocchi on a lightly floured plate. 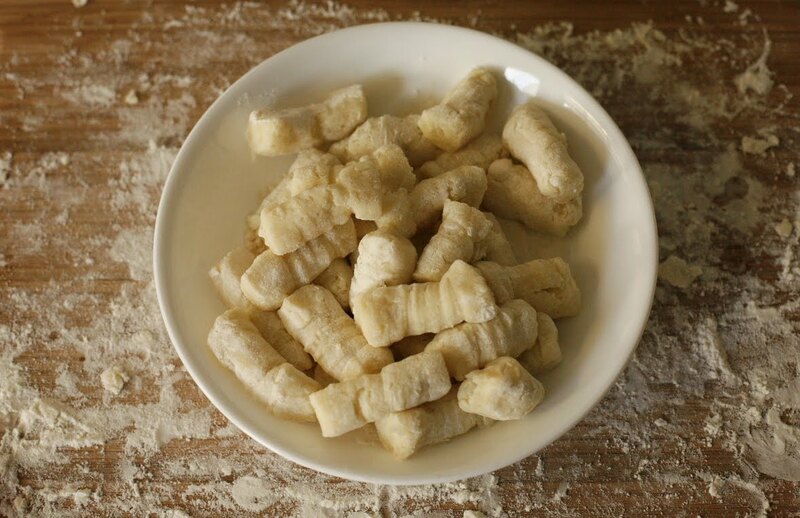 Now you can either freeze the gnocchi or it must be cooked immediately. 12. Your water should be boiling by now. 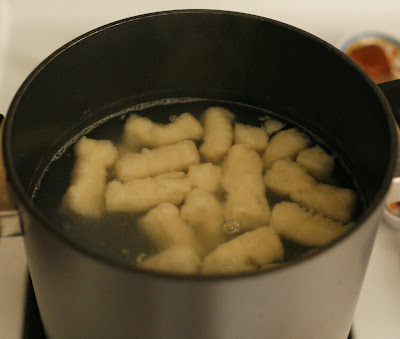 Add the gnocchi, stir and allow to cook for a minute or two, until they float to the surface. 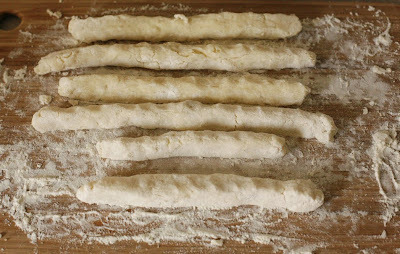 Allow them to stay in for 30 seconds longer and them remove using a slotted spoon. Drain well. 13. Remove the bay leaves for the pot of sauce. Then transfer the gnocchi to the pot and gently stir over low heat. Delicious! This looks like the perfect meal. 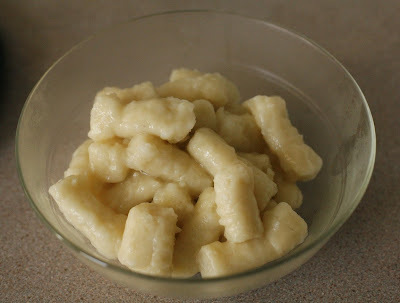 I LOVE gnocchi so much! Those gnocchi look perfect. I can't believe it was your first time making them...I mean because they look so good. I've made them once or twice and they came out all wonky. That ragu sounds super delicious too. 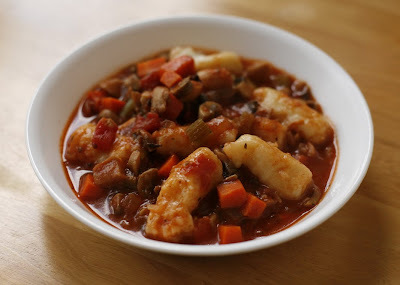 Great looking gnocchi, this would be right up my alley since I love fungus with my pasta.